Add A New Contact to Group Message on iPhone – iMobie Inc. If you have started a group chat on iPhone by sending messages, and want to add a new member to this group message, this guide will show you how to make it. Go to download this useful software to transfer and manage your messages after reading this guide about how to add a new contact to group message on iPhone. If you have updated your iPhone to iOS 8 or later, you may have sent group messages on your iPhone. When you chat with friends by messages and want to add a new friend into this group, you may not know how to make it. 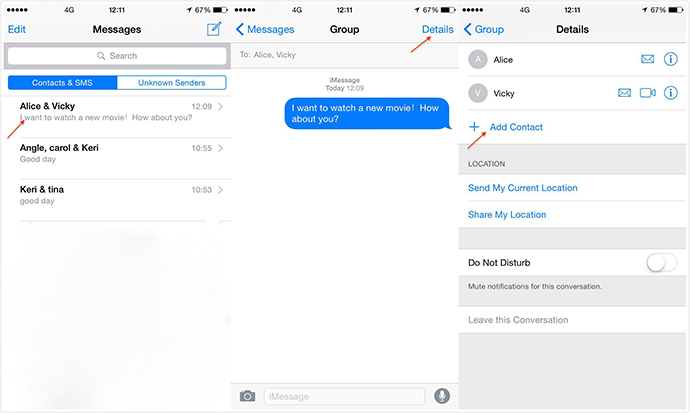 Here, in this guide, we will show you how to add a new person to a group message on iPhone. But what we should know is that the method mentioned below works when everyone in the group is using iMessage. Besides, the person added in the group can only receive the messages from the point he or she has joined. Step 1. Open the Messages app. Step 2. Find the existing group message you want to add a contact. Step 3. Tap "Add Contact". Step 4. Choose the contact you want to add, and select "Done". If you want to backup your messages on your iPhone, you can use AnyTrans to transfer messages from iPhone to computer. If you still have any question about this guide, you can contact our support team by Email. If you like this guide, don't forget to share it with your friends.